(AP)—Two giant panda cubs are being rotated between their mother and an incubator to ensure the newborn twins are properly fed and receive equal doses of maternal nurturing, officials at an Atlanta zoo said Tuesday. A 15-year-old giant panda named Lun Lun gave birth to the cubs Monday evening at Zoo Atlanta. An ultrasound confirmed Lun Lun's pregnancy in June, but officials say they were unaware she was having twins until the second cub emerged minutes after the first. "It was a surprise to us but not a shock to us that she had twins. Lun (Lun) did not really comply with the ultrasound all that well. This pregnancy she slept most of the time," said Zoo Atlanta's deputy director, Dwight Lawson. He said the mother's long bouts of sleep during pregnancy didn't leave veterinarians much time to check her thoroughly via ultrasound. Lun Lun was artificially inseminated in March and has been under 24-hour observation by a camera providing a live Internet video feed from her den. The father is another giant panda at the zoo, Yang Yang. The cubs are the first giant panda twins to be born in the U.S. since 1987. Each came into the world hairless and taking on a pinkish color. Lawson said one weighed about 3.5 ounces (100 grams) at birth and the other just over 5 ounces (140 grams). Lawson said both cubs appear healthy, but zookeepers are taking precautions because of a high mortality rate among panda cubs. The cubs are tiny, undeveloped and able to nearly fit in the palm of a hand. They were born with their eyes closed like many mammals, and they're unable to regulate their own body temperature. Zookeepers say rotating the cubs between incubator and the mother is a key step in their survival. 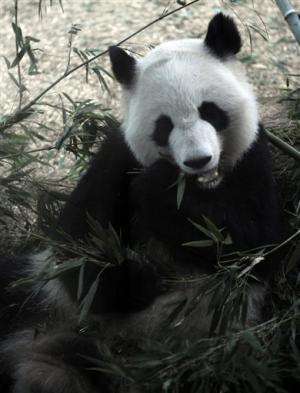 "They're doing well, the trick with panda twins is that the female typically only cares for one and abandons the other. That's normal, they're just not able to raise twins on their own," Lawson said. Rebecca Snyder, curator of mammals, said in a statement released by the zoo that Lun Lun is a "good mom," but is reluctant to give up whichever cub she has at any time. "We have not been able to swap the cubs as frequently as we would like. Because of that, both have been supplemented with some formula. Both are doing well with this," she added. Snyder said the first days are critical and will guide the actions of the caretakers. Zookeepers note that the last twin pandas born in the U.S. in 1987 died, adding twin births raise the likelihood of complications. The twin cubs are Lun Lun's fourth and fifth children. Hines said Lun Lun's 15-year-old partner—Yang Yang—and the cubs' older brothers—Xi Lan, 4, and Po, 2—remain on exhibit, and will not be housed with Lun Lun or the cubs for the time being. A third sibling, Mei Lan, 6, was sent back to China in 2010. "Basically, they all go back just prior to reaching sexual maturity so they can be part of the larger breeding pool in China," Lawson said. The giant panda research program began at Zoo Atlanta in March of 1997 in partnership with the Chengdu Research Base of Giant Panda Breeding. 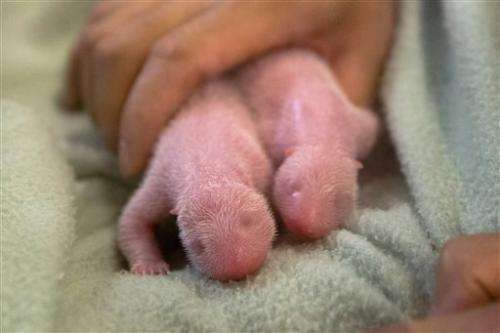 Zoo officials said their Chinese counterparts were in Atlanta this week to help care for the newborn cubs. The method of switching twin cubs between the mother and an incubator was developed by researchers from Chengdu, and has been successful in China—where zoo officials say twin giant panda cub births are more common. Less than 1,600 giant pandas are said to be living in the wild and most are known to live in mountainous regions of China. Zoo Atlanta was given an International Conservation Award from the Association of Zoos and Aquariums in 2012 for its work to preserve the species. The cubs won't be named until they are 100 days old—in keeping with a Chinese tradition, Lawson said. Zoo Atlanta officials said they'll likely learn the gender of the cubs in the coming week. If the panda cubs survive, they're expected to be open to visits from the public this fall.